Here's a fantastic new slots game to feature on Wizard. Take a trip to candy land where you will be drooling over all the sweet treats on offer! Be prepared for some serious sugar cravings after spinning the reels of this slot from Eyecon, adapted from their popular Sugar Train slot to include the same yummy delights but now with the added excitement of a progressive jackpot! Some of the sugary goodness on offer includes jelly babies, massive lollipops, chocolate bites loaded with gooey cookie dough, heavily iced cupcakes, glazed doughnuts, and colourful hard boiled sweets. Our stomachs are rumbling just thinking about it! These delicious treats scroll past against an idyllic background of luscious green fields peppered with candy cane traffic lights and lollipop signposts. So don’t delay, and take a ride on the sugar train to candy land! Founded in 1997, Eyecon has the expertise and reputation one would expect from leaders of the online gaming industry. They were recently acquired by Playtech for a whopping £50 million! For similarly mouth-watering games by Eyecon, why not try 99 Time or Happy Birthday! They also have a festively themed version of Sugar Train, Sugar Train Xmas. 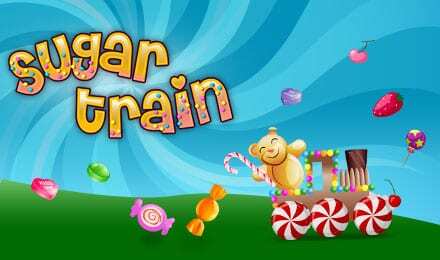 Click the link to see slot games from the developers of Sugar Train Jackpot! This is a 5 reel 25 payline slot with the same design as Eyecon’s Sugar Train slot. However, this version contains three progressive jackpots that can be triggered at any time. It has an RTP of 95.00%. If you want your hands to be free to scoff at candies, set up the Autoplay function to spin for you. Are you looking for more high RTP games? Play them today from this list! The jelly baby Scatter icons are not only tasty – they will win you free spins if you line up at least 3. 5 of these guys will secure you the maximum of 25 free spins. You will also want to keep an eye out for the rainbow icons, as lining up 3 or more will take you to a Prize Pick round. 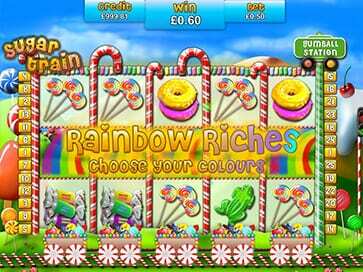 Here you will choose from a number of colours to reveal win multipliers, helping you to win big! There are even more bonus features to look forward to – keep your eye on the Gumball Station sign at the right-hand side of your screen because when the red gage reaches the top, the gumball feature will begin! This will see carriages pass along the bottom of the screen carrying gumballs – you need to collect these gumballs as each of them offer a different multiplier value which could be as high as 500x your total bet! As if Eyecon’s original Sugar Train wasn’t popular enough, they have managed to make it even more exciting by releasing this version with three progressive jackpots that just keep growing the more you play! This enhances the already high levels of excitement provided by several bonus features such as the Gumball and Prize Pick rounds. 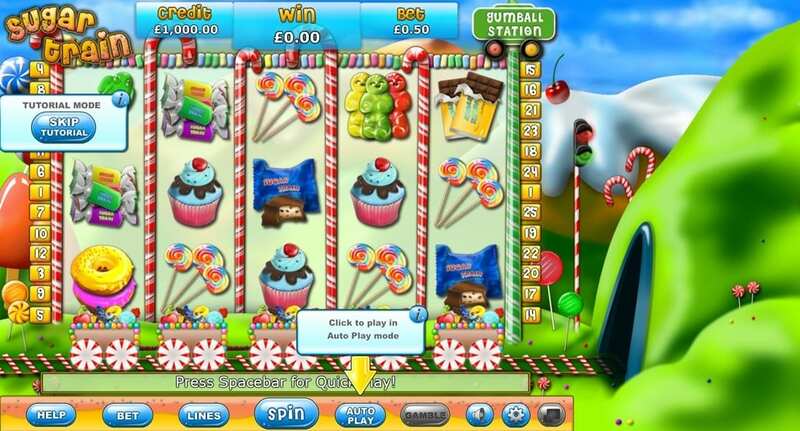 In addition to these varied features which easily hold players’ attention, the tasty aesthetics add to the appeal and ensure Sugar Train Jackpot is a slot you’ll keep coming back to.